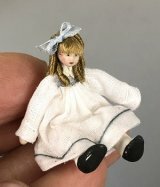 This little porcelain doll with glass eyes, Kestner's "Gem," is jointed at the shoulders and hips, and also at the knees and elbows. 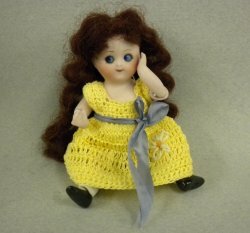 She wears a cute yellow crochet dress, ready to join your other little dolls. She is sitting so you can't see her knees or one strap black shoes. Made by Carl Armstrong.